Abstract. Nitryl chloride (ClNO2) is a dominant source of chlorine radical in polluted environment, and can significantly affect the atmospheric oxidative chemistry. However, the abundance of ClNO2 and its exact role are not fully understood under different environmental conditions. During the summer of 2014, we deployed a chemical ionization mass spectrometer to measure ClNO2 and dinitrogen pentoxide (N2O5) at a rural site in the polluted North China Plain. Elevated mixing ratios of ClNO2 (>350pptv) were observed at most of the nights with low levels of N2O5 (<200pptv). 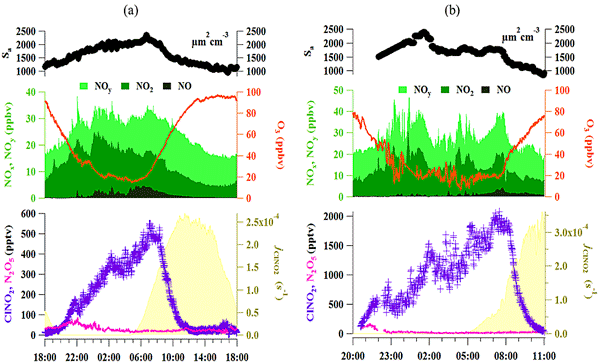 The highest ClNO2 mixing ratio of 2070pptv (1min average) was observed in a plume from a megacity (Tianjin), and was characterized with a faster N2O5 heterogeneous loss rate and ClNO2 production rate compared to average conditions. The abundant ClNO2 concentration kept increasing even after sunrise, and reached a peak 4h later. Such highly sustained ClNO2 peaks after sunrise are discrepant from the previously observed typical diurnal pattern. Meteorological and chemical analysis shows that the sustained ClNO2 morning peaks are caused by significant ClNO2 production in the residual layer at night followed by downward mixing after breakup of the nocturnal inversion layer in the morning. We estimated that ∼ 1.7–4.0ppbv of ClNO2 would exist in the residual layer in order to maintain the observed morning ClNO2 peaks at the surface site. Observation-based box model analysis show that photolysis of ClNO2 produced chlorine radical with a rate up to 1.12ppbvh−1, accounting for 10–30% of primary ROx production in the morning hours. The perturbation in total radical production leads to an increase of integrated daytime net ozone production by 3% (4.3ppbv) on average, and with a larger increase of 13% (11ppbv) in megacity outflow that was characterized with higher ClNO2 and a relatively lower oxygenated hydrocarbon (OVOC) to non-methane hydrocarbon (NMHC) ratio. How to cite: Tham, Y. J., Wang, Z., Li, Q., Yun, H., Wang, W., Wang, X., Xue, L., Lu, K., Ma, N., Bohn, B., Li, X., Kecorius, S., Größ, J., Shao, M., Wiedensohler, A., Zhang, Y., and Wang, T.: Significant concentrations of nitryl chloride sustained in the morning: investigations of the causes and impacts on ozone production in a polluted region of northern China, Atmos. Chem. Phys., 16, 14959-14977, https://doi.org/10.5194/acp-16-14959-2016, 2016. This work addresses the unclear global significance of chlorine activation processes in the troposphere. The first high-quality measurement data set of ClNO2 in northern China revealed strong ClNO2 production in the residual layers, and demonstrated its significant effects on radical budget and ozone production. 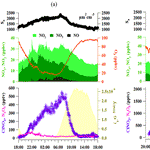 Our findings imply the widespread effects of ClNO2 over the polluted regions of northern China, which may increase photochemical and haze pollution.